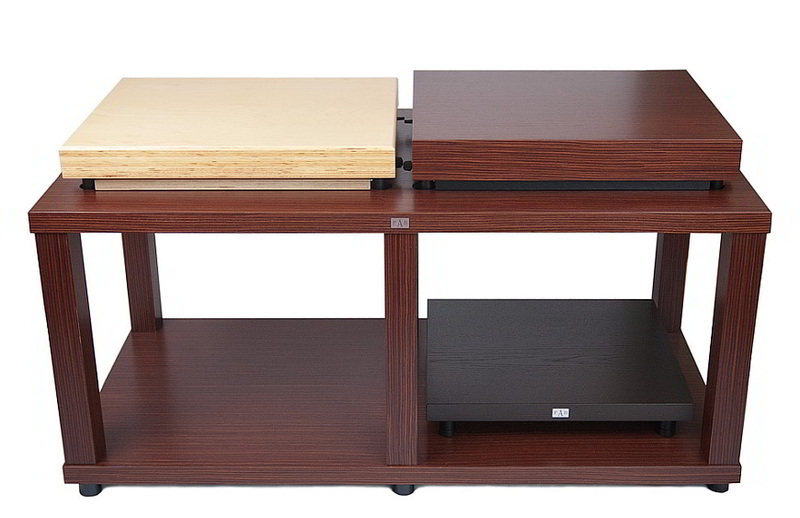 Racks for placing platforms − PAB AVD (AVD − anti-vibration dock) − are the newest Pro Audio Bono product. They were shown for the first time during the Audio Show 2011 in the Sobieski Hotel in Warsaw, where they got a lot of interest from PAB anti-vibration platform users. The name for those racks comes from their functionality. 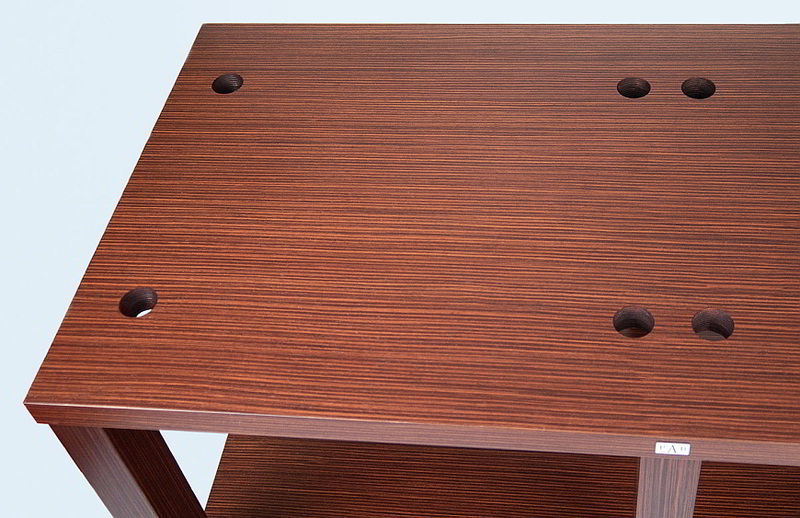 Inverted basic platforms can be placed in special holes in the table top, and platforms, where, covered with special “hats”, those form convenient, soft suspended bases with splendid anti-vibration capabilities. 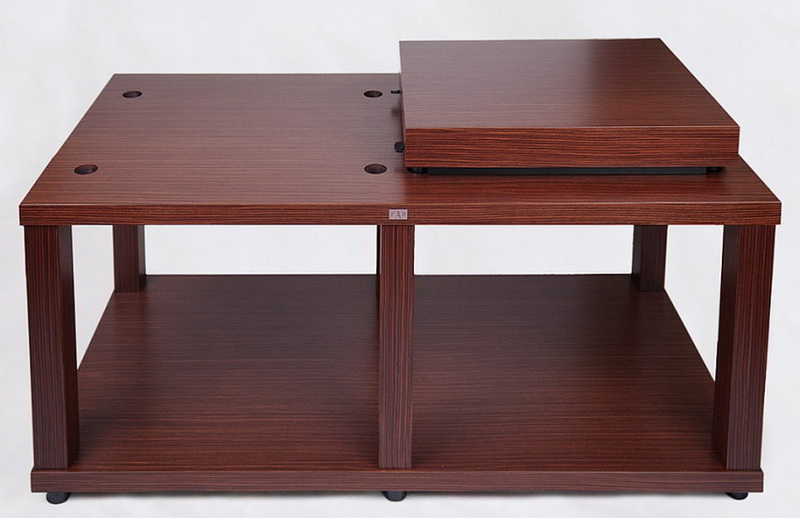 Due to the principle of work and effectiveness, the covered basic platform, using the table top or basis as the podium, works as a reference platform. The PAB AVD is made from a basis and table top, which are connected by 6 massive legs. All elements are made from plywood covered with oak, maple or birch veneer. On demand other, modified veneers are available. The table top and basis have the following dimensions: 49.6 x 23.6 x 1.4″. The legs have square cross-section (2.8 x 2.8″) and have 17.7 or 21.7″ height. On the bottom of the basis, in the axis of each of the legs, there is a socket for 8 mm bolts, which allow usage of 6 PAB anti-vibration feet with height adjustment. This allows for ideal levelling of the table on uneven floor, with level differences of ± 0.2″. The load capability of the PAB AVD is 881.9 lb. This means, that on the table top and the basis up to 440.9 lb can be placed. However, this is only true, when the inverted platforms are not installed. If two platforms are installed − the total load can be 626.1 lb (load of one shelf + load of 2 basic platforms). When 4 platforms will be installed − the maximum load will be diminished to 370.4 lb (the combined capacity of 4 platforms). The rack is designed to be used with 4 large devices. However more devices can be accommodated, if the holes for the platforms are covered with special PAB metal plugs. 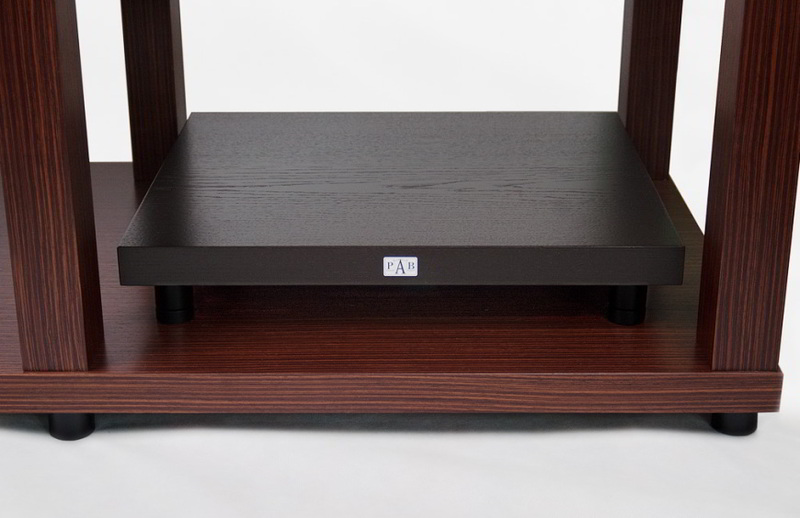 The PAB anti-vibration dock is a universal product. It allows to place electronic devices on anti-vibration platforms or without them − directly on the table top and basis. In the second case, 5 devices weighing about 176.4 lb each can be placed, two on the bottom basis, and three on table top, or 4 even heavier units − up to 220.5 lb each. This means, that it can carry and isolate from vibration almost all electronic devices available currently on the market.